Please divide the cell containing the description into two. Text "Description" is in a bad position. 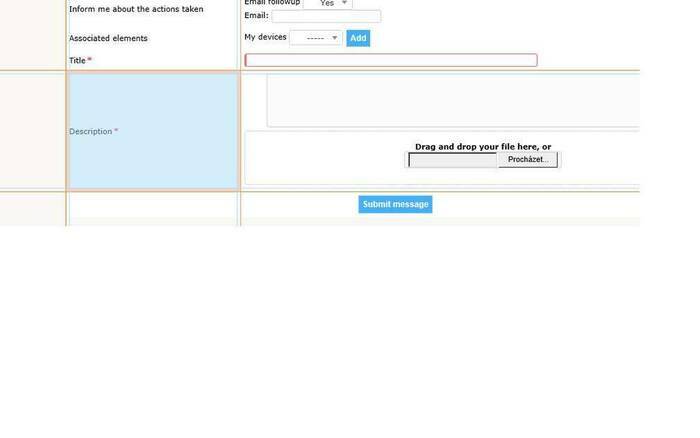 Existing cell is shared with TextArea and Drag and Drop area. I don't understand your problem. Can you post a screen shoot? I don't have your issue, ticket description and add document are in two different parts. But your screen shoot show a no standard form of GLPI. Have you change the form display? Text area "Description" and "Drag and Drop" are in separate cells - OK. But a label in one merged (Blue cell in image), BFU want to edit Drag and Drop area. And align Text area. Use only changes available in ticket template settings.